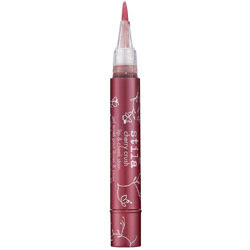 Previously in my Stila To Buys post, I have talked about Cherry Crush which is kinda like Benefit's Benetint Lip & Cheek stain tint but in a clicky pen just like the famous Stila Lip Glazes but unlike it, this is a more convenient and easy way to get that natural girly flush you always wanted! AND a little bit more extra information from my own review and please be warn this is strictly 18SX content! The natural girly red flush from using the crushes? they're like that glow u get after getting jiggy with your husband. Virgins u don't know what I am talking about ok! (ok la maybe after running 10 laps around the track kinda effect?) Here's a video tutorial on youtube by pinkiecharm. A multi-tasking lip and cheek stain. This revolutionary makeup stain moisturizes, provides antioxidant protection and has a unique look on each person's skin, creating the perfect shade every time. Housed in a berry red click pen adorned with a silver cherry blossom design, Cherry Crush reacts to the pH levels in the cheeks and lips creating a personalized blush and pout. In addition to being scented and flavored like a just-picked cherry, Cherry Crush contains cherry and pomegranate extracts to provide skin and lips with antioxidant protection. Vitamins A, C & E are the cherry on top, as they provide further antioxidant protection and drench the skin in moisture, ensuring skin and lips never feel dry or tight. The Latest Crush Color from Stila! A multitasking lip and cheek stain in a deep plum hue. Stila Pomegranate Crush Lip and Cheek Stain is infused with naturally staining pomegranate extracts that react to your personal pH levels to create a personalized deep plum shade. Packaged in Stila's iconic clickable pen, the revolutionary formula is easy to build and blend, plus it leaves your lips and cheeks with a fresh flush of youth. In addition to being scented and flavored like a fresh pomegranate, Pomegranate Crush contains pomegranate extract to provide your skin with antioxidant protection. Vitamins A, C, and E moisturize the cheeks and lips and leave them with a sheer, fresh, and radiant glow. ohhhh..now i know which is which. tQ Miu for e Pom Crush pic. u luv both cherry n pom? is it still available at Stila counter now?when is their last restock at BU?? adamuiz: if i get to buy tomorrow i let u know! anonymous: last friday BU restock and they did sell many cherry crush. Yesterday i check with them at lunch time, no more. Maybe got stock coming soon in a few days. I want one of those too! Miu, I'm a new reader! Do you have any to spare? How much are the selling? Hey, thanks for the price update! Erm...I know it's too much to ask, but if you have any of those crushes to let go, please let me know! Thanks a billion!